The following article is about home remedies to remove tartar naturally. The question arises here is what tartar is? Tartar or calculus is a yellowish-brown material which gradually covers the surface of the teeth. The material contains plaque, bacterial debris that makes it crusty. It causes discoloration of the teeth. Not maintaining good oral hygiene and not visiting the dentist for a regular check-up is the only cause of tartar formation. If it is not treated on time then it may lead to bad breath, yellowing of teeth and cause you to lose your teeth. To keep the problem at bay regularly brush your teeth, floss them properly and not to forget, go for dental check-ups. However, if you are experiencing the problem then you should follow following home remedies to remove tartar. Baking soda is antibacterial and has a mild abrasive action which helps to treat tooth decay and tartar formed on the teeth. In a small bowl mix a tablespoon of baking soda with a pinch of salt. Slightly wet your toothbrush and dip it into the mixture and brush your teeth. The regular use of this mixture will help you get white teeth. Do this regularly to maintain the oral hygiene. Often we are allured by the fancy advertisement of the toothpaste and buy it before releasing whether it will be effective or not. Always look for tater-control toothpaste. The regular use of this toothpaste will remove the tartar and the plaque also it will also save your teeth from decay. Go for toothpaste which has ingredients such as pyrophosphates, fluoride, and zinc citrate and etc. These ingredients prevent the formation of the tartar. Fluoride toothpaste is also good for teeth. It strengthens the teeth and helps you to get rid of the dental cavities. Moreover, it makes the tooth enamel strong. Strong tooth enamel means less risk of tartar formation and it kills the bacteria which lead to tartar as well. So always use replace your regular toothpaste with the fluoride toothpaste. To cleanse your teeth naturally munch apple after the meal. The juice of the apple will fight back with the bacteria’s and debris deposited over the teeth. Also, it will remove the food particles and strengthen your gums. Apart from apple you can also munch carrot, celery sticks and other vegetables and fruits which are juicy. Make sure you munch the vegetables and fruits after an hour of the meal. Aloe-Vera has anti-bacterial and anti-inflammatory properties which helps to fight back with the bacteria and which causes gum disease. In a cup of water, add a teaspoon of Aloe-Vera gel, a few drops of lemon essential oil, a few tablespoons of glycerin and a half cup of baking soda. Mix all the ingredients thoroughly. Use the mixture to scrub your teeth. Do it regularly to treat the gum disease and to prevent the formation of the tartar over the teeth. Sesame seeds also help you to remove the tartar. All you have to do is chew a few seeds of sesame. Then brush your teeth with a dry brush. However, make sure that the chewed sesame seeds are still in your mouth. The seeds work as a natural scrub which helps to clean the gums and teeth. Also, it helps to remove the tartar. Do this regularly if you experience any gum tooth disease other 2-3 a day is enough. Another home remedy which comes handy for removing the tartar is orange peel. It helps to get rid of the discoloration. Rub a lemon peel over the teeth for a few minutes and leave it overnight. Next day rinse it thoroughly. Or, grind the dried peel of the orange and mix it with your regular toothpaste while brushing the teeth. 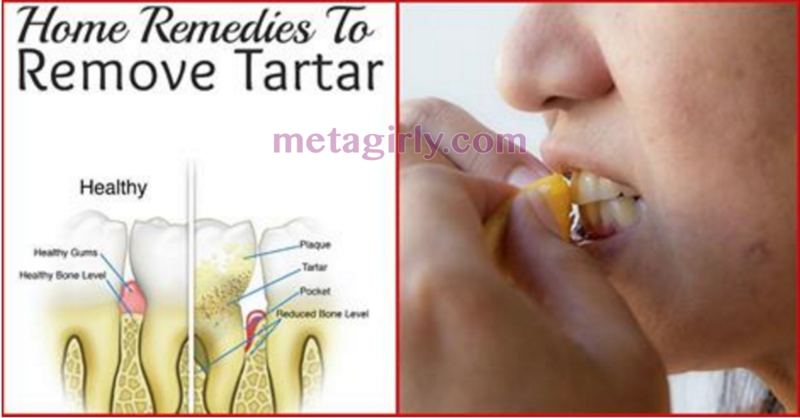 Do this regularly to remove the tartar. Figs are packed with essential nutrients such as vitamin A, B1, B2, calcium, phosphorus, sodium, iron, chlorine and potassium. It helps to clean the teeth and gums naturally. Slowly chew 3-4 figs a day to remove the tartar. Chewing improves the secretion of saliva, which helps to keep the teeth clean and remove tartar and plaque. Another way of removing the tartar from the teeth is munch fruits loaded with vitamin C. Tomato, strawberries, gooseberries and etc are a rich source of vitamin C. Apply the paste of these fruits on the teeth and leave for a few minutes. Then rinse off your mouth with the mixture of baking soda and warm water. This kills the bacteria, helps you to get rid of the plaque, tartar deposited over the teeth. Eating vitamin C rich fruits keeps all the oral problems at the bay. Hydrogen peroxide can also help you to prevent the tartar. All you have to do is in a small bowl mix a tablespoon of antiseptic mouthwash and 3 tablespoons of 3% hydrogen peroxide solution. Use it to gargle. It will loosen the tartar deposited over the teeth which you can easily remove. Gargle your teeth with this solution every meal or at least once in a day. This remedy has proved beneficial from the ages. Use refined olive or coconut oil for oil pulling sip a few tablespoons of the oil, do not swallow it. Swish it around the teeth and the gums for minutes and then rinse your mouth with warm water. Do these regularly early in the morning keep away the oral problems? Keep a dental pick and small mirror along with you. After having the meal see the areas where food particles are accumulated and with the help of the dental pick remove it. Spit the waste particles and rinse off the mouth. Make sure, you scrap the waste particles gently otherwise you may hurt your gums. Previous post: How To See Without Glasses?